Schrödinger’s bisexual AKA The Black Canary, Canary, and White Canary. Sara is a former assassin, captain of a time ship, traveling through space and time to correct broken history … and sleep with women. Trained by the League of Assassins, Sara was killed and subsequently resurrected via a Lazarus Pit on Arrow. Since she’s not supposed to be alive, Rip Hunter picked her up for his time traveling mis-adventures on Legends, where she made sure to give her girlfriend’s dad the perfect name for his second daughter and set up a date. After Rip went missing, Sara became the captain. Sara is both alive and dead depending on when and where she happens to be at any point in time. Or what universe. In the Pilot of Arrow, she was presumed dead after the Queen’s Gambit sank. In a flashback, again in Arrow, she was thought to be dead by Oliver and Slade after she fell from the Amazo. She was killed for real by Thea (under the control of Malcolm Merlyn) on October 8, 2014. She was later revived by the Lazarus Pit and her soul was returned to her body not long after. She was killed again in an erased timeline, along with Laurel and Quentin, by Damien Darhk, but since Rip Hunter recruited her months prior to this Sara and Quentin were both saved from their fates. 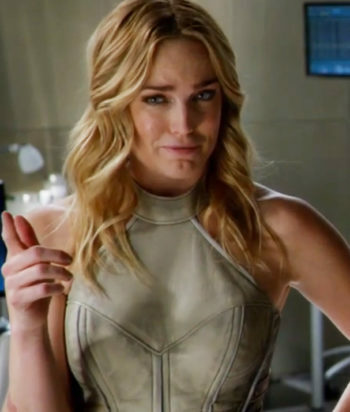 In another erased timeline, Sara and the rest of the Legends were killed under unclear circumstances instigated by Eobard Thawne, but since Rex Tyler traveled back to warn them of this her death has been erased. While time traveling with the Legends, she was almost got killed by Rip Hunter (and was thought to be dead by him and Jefferson Jackson), but because her brain cells were still functioning, she was saved by Gideon. Sara died in one of the various realities created by Constantie and Charlie mucking about in the time stream in “Legends of To-Meow-Meow.” There, she was gored by a unicorn, leaving Ava sad and morose and listening to Indigo Girls in a dark room.